Arsinoitherium was a genus of rhinoceros-like herbivores (plant-eaters) that lived in tropical rainforests and on the edges of swamps and marshes, from the late Eocene epoch to the early Oligocene epoch, between about 36 million and 30 million years ago. 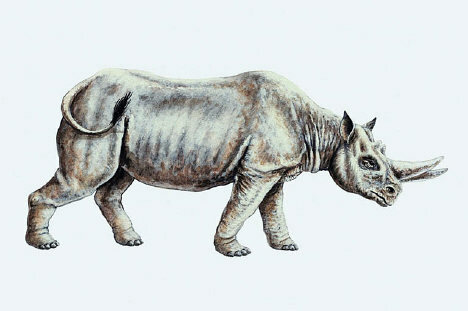 Arsinoitherium was about 10 feet (3 meters) long, and about 6 feet (1.8 meters) tall at the shoulders. It had two huge horns, with cores of solid bone, projecting from its nose, and a pair much smaller horns on the top of its head.